I was excited about Parma. 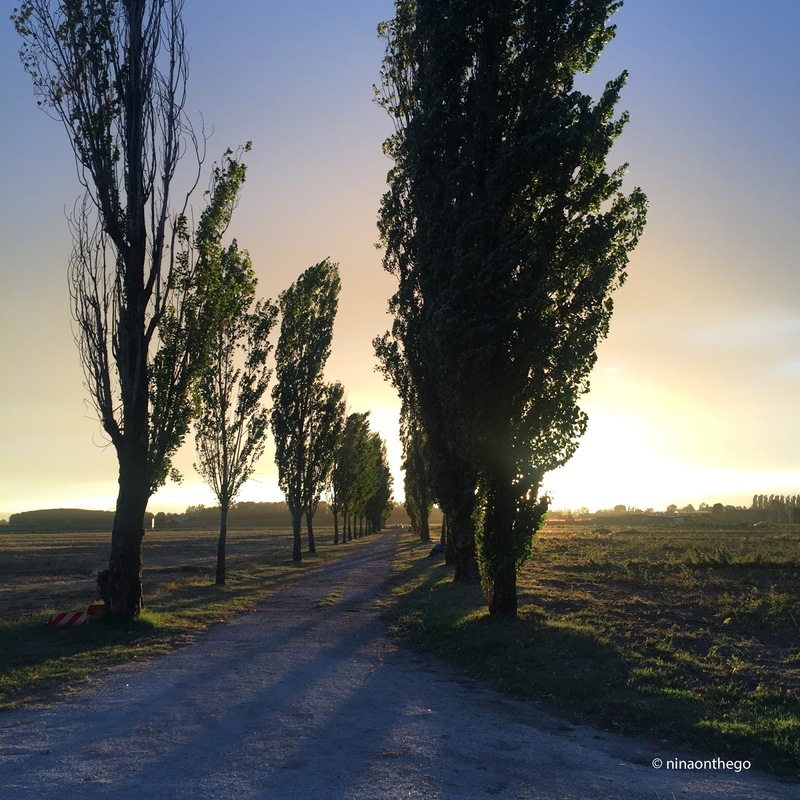 After booking nights in Venice, Milan and Bologna, I knew that I wanted to spend a little bit of time in the countryside, to find some quiet, to write, and to eat. What I actually mean is, I wanted to experience the local specialities that Anthony Bourdain had shown me on a late-night re-run, which I just couldn't get out of my head. 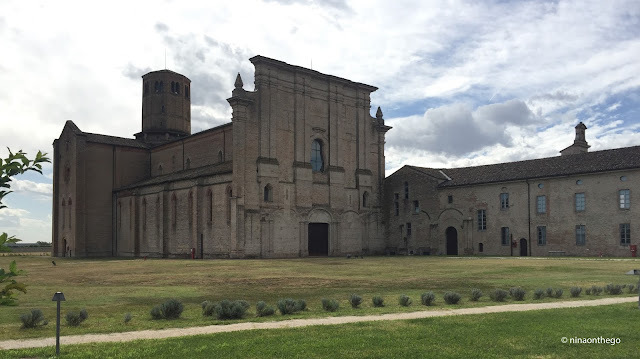 Flash forward a couple of weeks, and I was pulling up in a taxi in front of an old monastery about 5 kms outside of Parma, smack dab in Italy's northern region of Emilia-Romagna...the mecca of all things Italian cuisine. 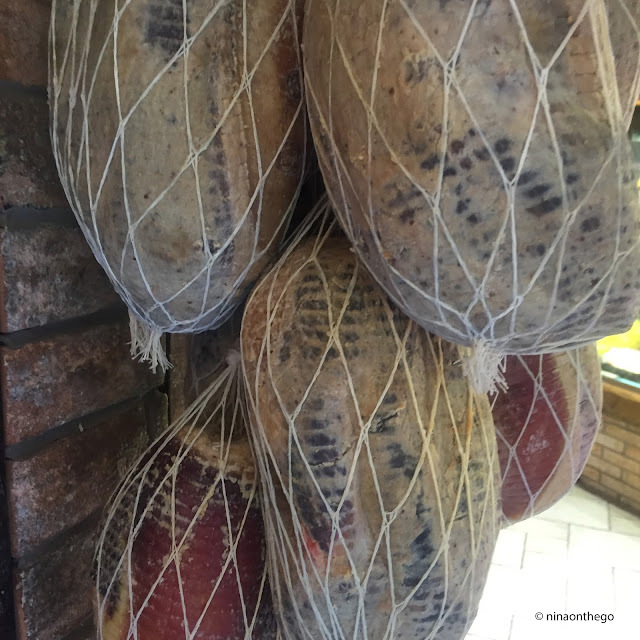 This is the land of sun-kissed tomato fields, damp, sea-salted cellars filled with hanging Mortadella, Prosciutto di Parma and Culatello di Zibello, and where chunks of Parmigiana Reggiano sit on shelves and wait and wait and wait some more. 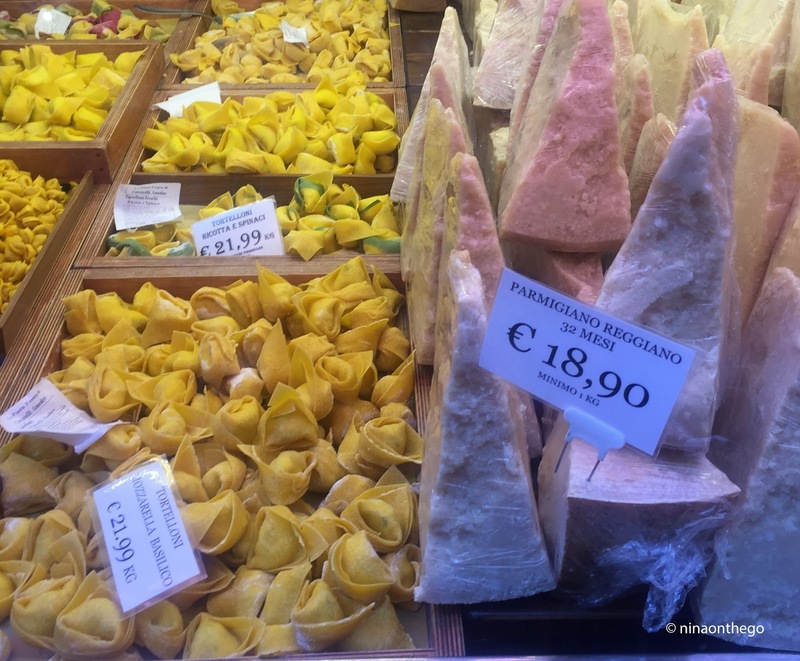 Think Italian and food, and there's a good bet you're picturing something that has its roots in Emilia-Romagna - the much-touted 'food basket of Italy'. Lasagne Verdi. Bolognese. Prosciutto e Melone. Aceto Balsamico di Modena. Porcini Mushrooms. Tagliatelle. As the taxi came to a halt in front of the arched entrance to the inner courtyard, dust from the gravel path enveloping me as I stepped out, a man stood up from the bench beside the doorway. He greeted me warmly and we shook hands. I gave him my name and said that I had a room for two nights. 'Yes, I know', he said and waved me inside, taking my small suitcase out of my hand. I should say that the place looked deserted. In Milan, where I had had two meetings the day before, the woman who had driven me to each appointment told me that in August all of the Italians head to the sea. Milan had also been deserted, and here, as I looked out across the golden fields surrounding the monastery I barely even saw a car, let alone a person. Except for this one Italian, who was now checking me in. He had thinning hair, a three-day beard, was wearing a t-shirt and cut-off jeans and seemed molto rilassato (very relaxed). The Italian led me across the courtyard, past large abstract sculptures which were elegantly scattered around (I later found out that most of the monastery is a museum, while only the monks' former quarters are part of the hotel) and in very broken English he said, "Oh by the way, the bistro is closed. The owners are on holidays." I stopped walking, and in my most friendly tone, said something like "WTF?" I'm kidding. But, I did stop and say, "What do you mean it's closed? I don't have a car as you know, and I will need to eat something over the next two days." "Yes, yes, no problem. I cook for me, so I cook for you too. Yes?" YES! I asked the Italian when I should come down for dinner and he said around seven. "We'll start with a drink. Prosecco? Yes?" YES! At the door to my third floor room, he took out a large iron key (the exact one the monks probably used) and opened the small wooden door. I felt a little bit like Alice as I bent down to go into the room. The walls were massively thick...feeling ancient and cold, but the room, actually two rooms (a sitting room plus bedroom and bath) was beautifully new and clean, with a gorgeous fresco painted on one wall. I thanked The Italian and he left, and I began to unpack my things and take a look around. I decided to go outside and walk the grounds surrounding this impressive building. The warm wind blew over the fields of tomatoes lying dormant among golden arms of grass waving softly to and fro. 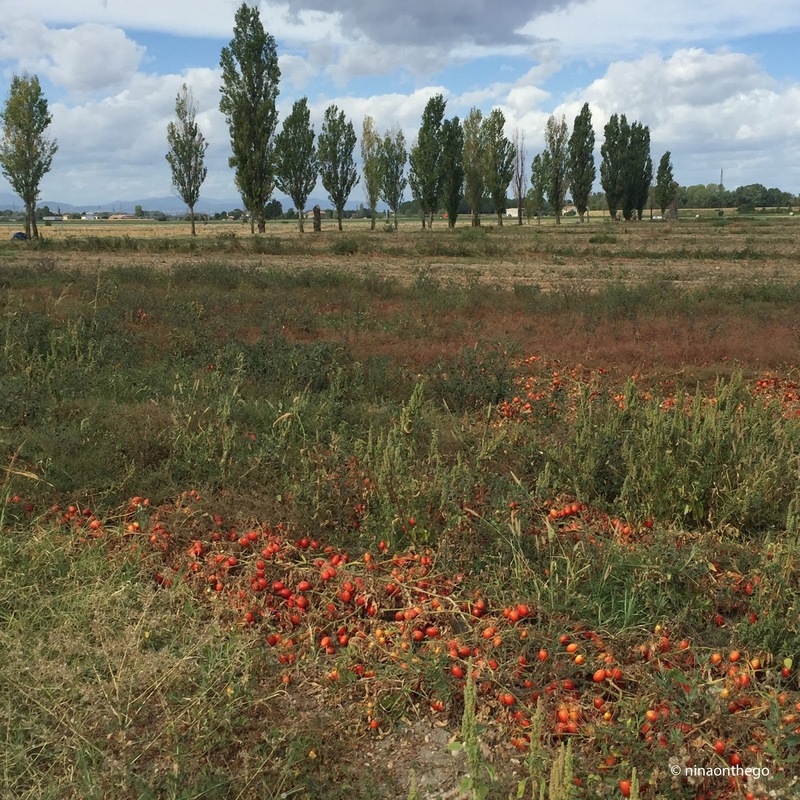 I have never seen tomatoes growing like this, endless plants just lying out on the ground. The Italian would later tell me that this area around Parma is known for growing some of the best sauce tomatoes in Italy. 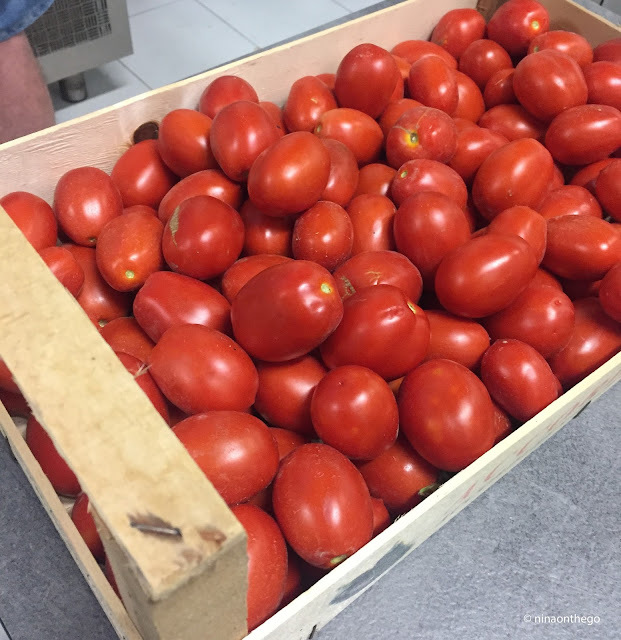 They smelled earthy and meaty and sweet as I held one to my nose; it looked like a large Roma tomato to my amateur eyes, but I didn't understand what he called them when I asked. Shortly before seven, I slowly made my way downstairs and outside. My long summer dress, which I had paired with a denim jacket and ballerinas, swayed in the breeze as I walked across the gravel courtyard towards the bistro. The doors were locked, but the Italian came out almost immediately and let me in. He smiled and checked me out a little bit, in a grinning Italian kind of way (which I just ignored) and asked if I would like a drink. 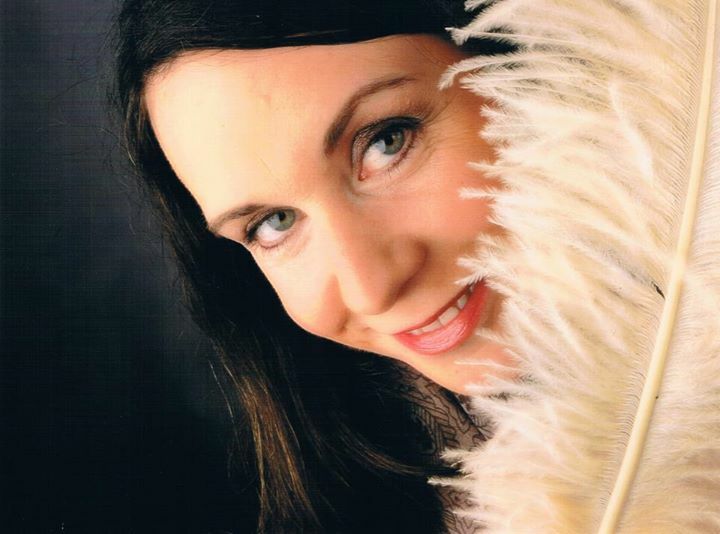 I nodded and looked around at the open room which had small white tables and chairs neatly arranged around the edge, while a large bar filled the entire centre of the bistro - wine glasses waiting on glass shelving, bottles standing at attention along the counter, and braids of garlic hanging and wafting. The Italian served me a glass of a local, chilled, sparkling red wine, called Lambrusco, which I had never heard of and immediately fell head over heels in love with. I took my wine outside onto the patio. I wasn't the only guest, which I began to realize as another couple saw me and immediately came over to the patio. They got the Italian's attention and ordered drinks (of course) just as he was about to join me. He apologised, went to serve them and then returned a few minutes later with a plate of thick slices of white Italian bread, buttered with heaping layers of prosciutto di parma, mortadella and salami di parma. "You hungry?" YES! The Italian said he wanted to show me the great hospitality the region is known for. I thought he was already doing a fantastic job of that. Once the other couple left, and the sun had gone down, he said he would start cooking us dinner. It would just be a simple bolognese sauce with spaghetti, if I was okay with that, because there was a family who he also had to cook for. That would be no problem, I assured him and followed him back into the bistro. I had no where to be. Just here...with my Lambrusco. The steaming plates of Spaghetti Bolognese came out, first to me, then to the others. At some point during this first evening he started calling me 'princess' which no one has ever called me in my life and I don't know why he started. Quite possibly it was the only 'flirty' word he knew in English. Eventually, he joined me and we ate the simple, but magnificent pasta. 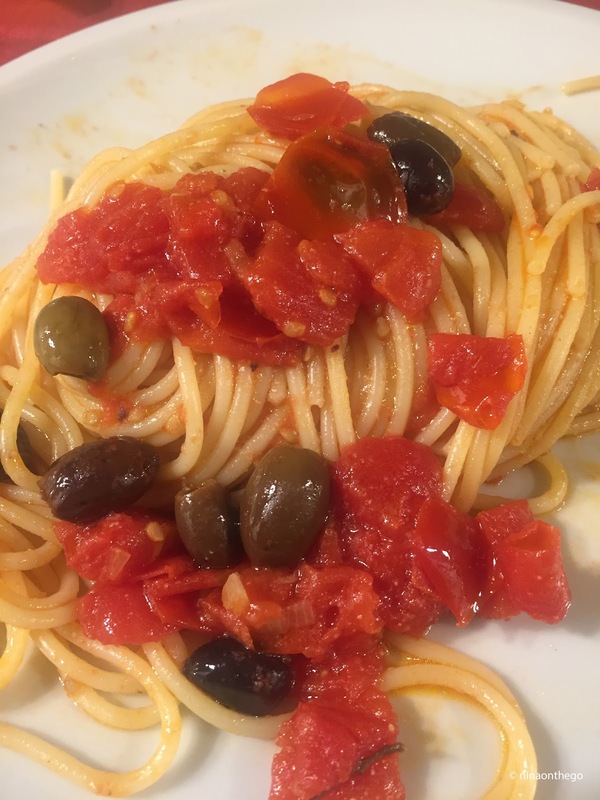 He had sautéed shallots in olive oil, and added black olives, and diced tomatoes from the field he had picked that morning. The family left, he cleared the dishes and filled my glass. It was late (Italian dinnertime is always late) and he poured himself a glass of white wine and sat down beside me on the bench against the wall. 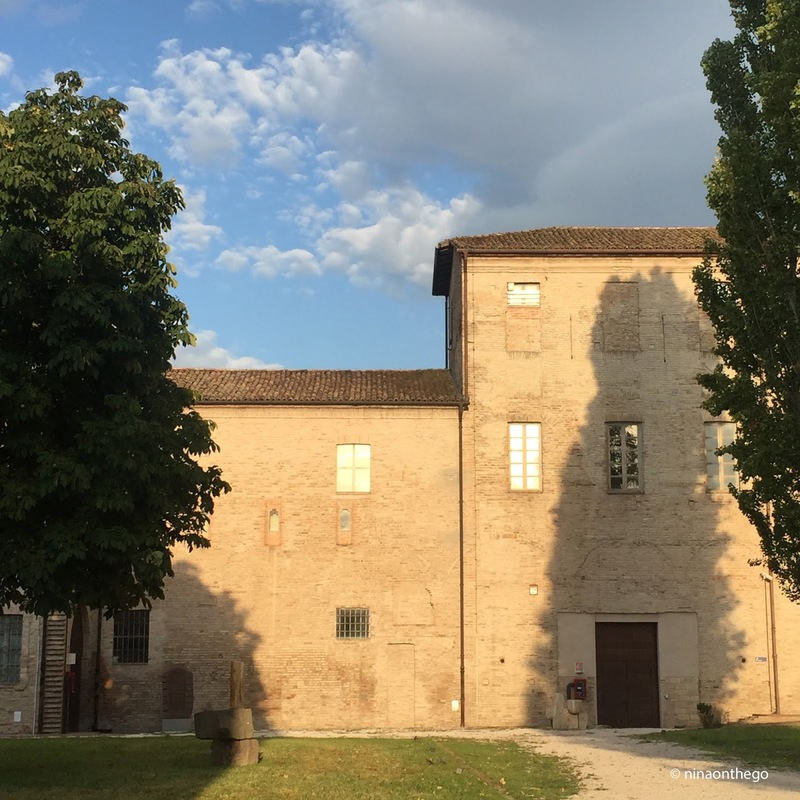 He chattered about his work; he was just filling in here at the monastery for ten days and would then head back up to Milan where he worked as a chef. He told me about his girlfriend, who he had earlier mentioned was missing him and constantly sending him loving texts. Her name was Francesca or Magdalena or some beautiful Italian name like that. He put his arm me, casually, like he'd done it a million times before. I laughed because it was just so subtle, so, I don't know, Italian. I took his arm and gave it back to him, and said ‘Just friends.' And he grinned, leaned into me and said, "Yes, but really good friends, no?" Ahhh no. "No, no, just normal friends." 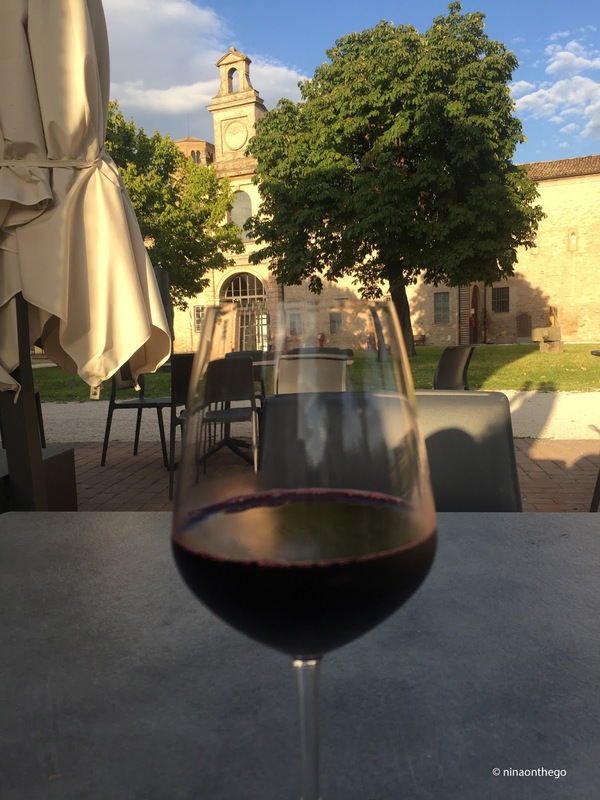 And with that, I decided that sitting here in the middle of nowhere and drinking with a super-friendly Italian dude might not be the best idea. I said good night. 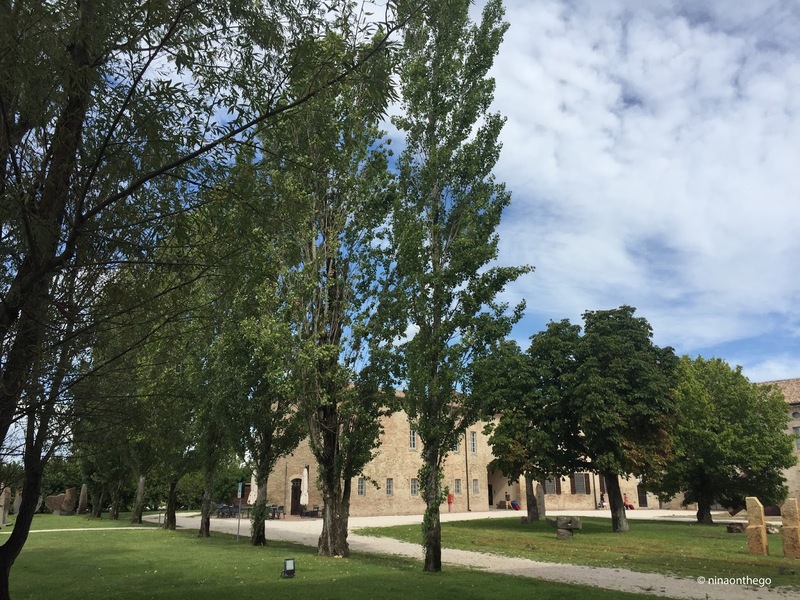 I slept like a baby in the stillness of the Italian countryside, and awoke to an azure-blue sky with just faint wisps of clouds rolling gently by. The Italian lit up when he saw me, and enthusiastically said good morning, as I entered the bistro for breakfast. I laughed and returned the greeting. He reminded me a bit of my puppy. Very, very friendly. Always in a good mood. Pretty much the perfect kind of host if you think about it. Before taking a taxi out to the monastery the day before, I had wandered through Parma's old town wanting to get a feeling of this region's reputation of being the culinary centre of the world (or maybe just Italy). The old town was easy to navigate, quaint and pretty, and almost completely empty. Except for me, pulling my orange carry-on suitcase over the cobblestones (not easy my friends), and two middle-age ladies exploring the church, there was not much going on here, on this hot, August day. I almost always read a lot about a place before I visit, checking blogs and platforms, in order to glean recommendations from locals. 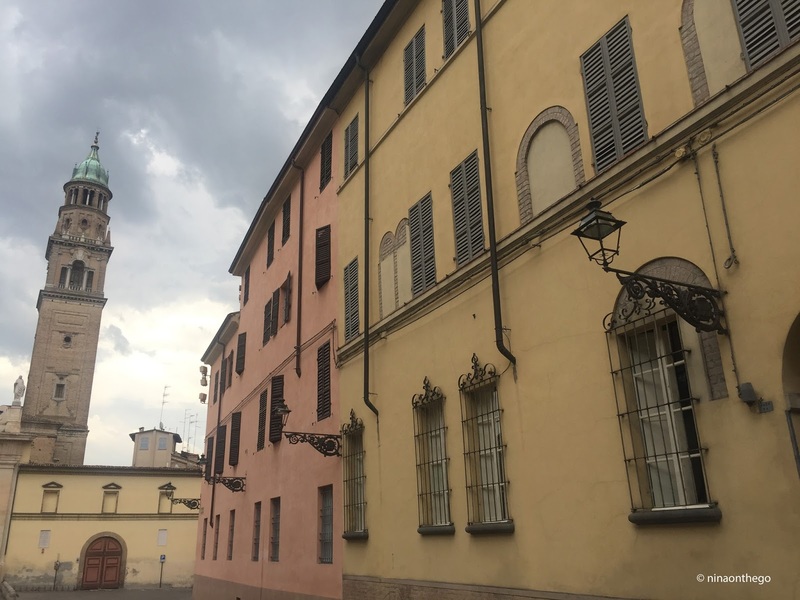 Therefore, on this day in Parma, I made my way to La Forchetta, a small trattoria on a quaint side lane within the centre of town. And, when I saw 'Parmigiana-reggiano 26 mesi' on the menu I ordered it almost immediately. How lovely, and a bit strange, to be able to order just chunks of really old parmesan! What I didn't know of course (but had expected) was that this was no ordinary parmesan. 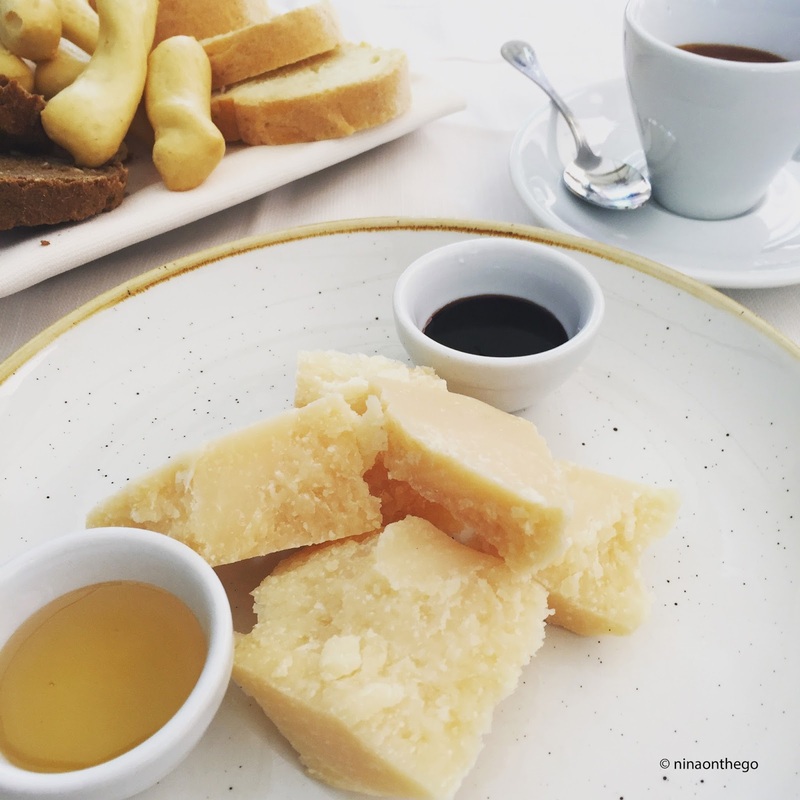 The plate came with bricks of crumbly, pungent cheese along with two small pots, one with honey and one with aceto balsamico di modena (originating just miles away). I dunked and dipped, experimenting with the lovely contradiction of flavours: sweet and savoury, creamy and smooth, mild and intense. Honestly, this was a truly unique dining experience for me...and it was divine. 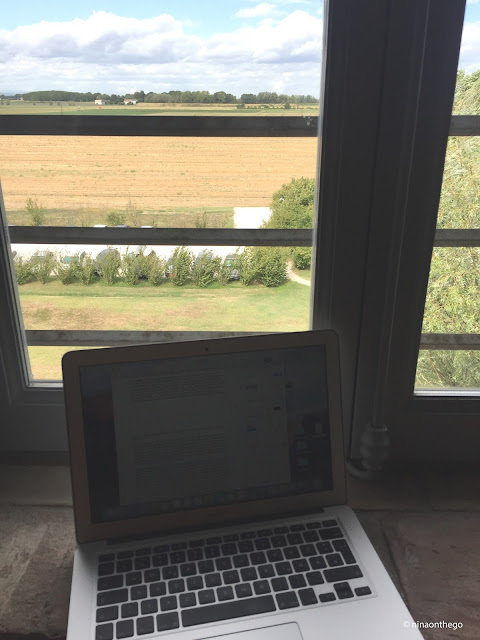 I spent my free travel day hunkered down in my monk's room, trying to work out some finicky details within my book project, for which I needed a distraction-free zone. This room was perfect - no TV, barely-functioning wifi, no radio, just quiet. At around 7 pm, as I walked back across the courtyard towards the bistro, I saw the Italian sitting on the bench under the arched portico smoking a cigarette. “Where were you for lunch? I had cooked for you.” I took a step back. “Really? Oh! Sorry about that (the Canadian in me never sleeps). I just decided to keep writing. I hope I didn’t put you out.” He brushed his hand away although I’m not quite sure that he had understood me. He stubbed his cigarette out and flicked it into the terracotta pot on the ground beside the bench, and stood, waving me through the bistro doors. 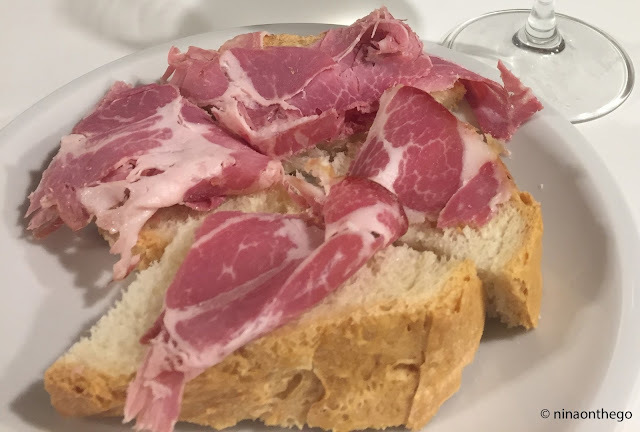 Again, he offered me a cool glass of Lambrusco, and again I accepted it very hapilly, and brought me a plate of thick bread heaped with ham. Now this was no ordinary ham, which he made clear to me. Unfortunately, I’m not a foodie (and I'm not going to pretend to be) so except for the salty, flavourful meat, which was delicious, I can’t really describe more about it. Of course, I couldn’t tell that there was about a 40€ difference between this and what I ate yesterday. All I can say was that it was very tasty. The Italian took great care of me, often checking if I was hungry and apologising that he had to cook for the other guests first. I definitely wasn’t hungry, and it was honestly so sweet having that kind of attention paid to me after what has been a rough couple of years in that department. I assured him that I was blissfully content sipping wine, and then he asked if I wanted to come into the kitchen while he cooked. I loved that idea, and followed him with wine in one hand, and my camera in the other. He said he would be making us something different, as he didn't want to eat spaghetti again. "Something better for us" he grinned. Okay. I was just thinking that this is all pretty perfect and I can watch and learn how to make a few different Italian dishes, from an actual Italian person - glad I hadn't wasted extra money on a cooking class here! 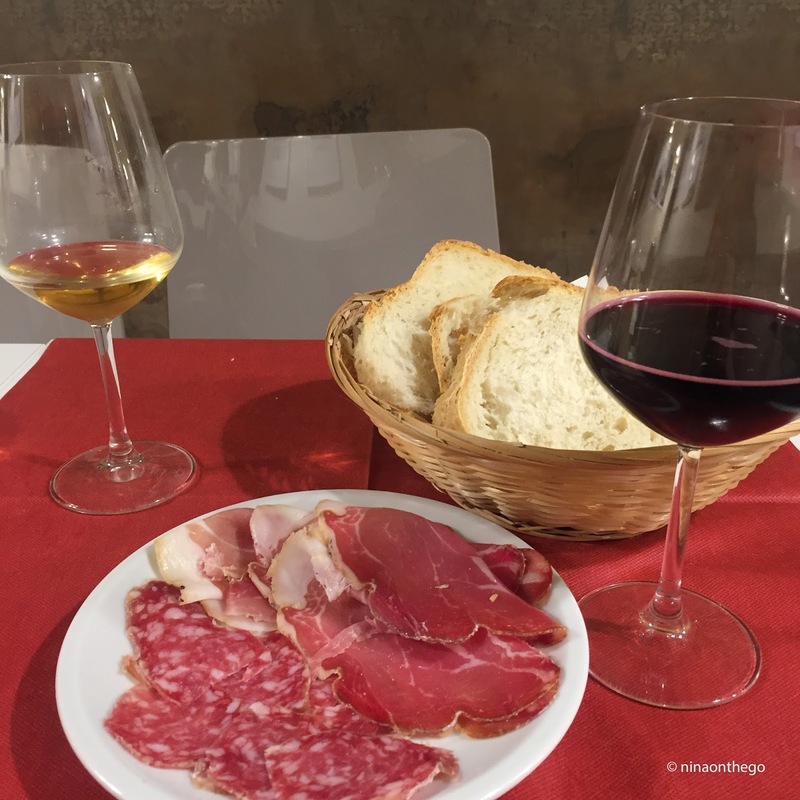 Before I had come to Italy I had looked into cooking classes, food tours, cheese-tasting afternoons and walking excursions around Parma, Bologna and Cinque Terre, but most of the tours were for a minimum of two people, and I was flying solo. So, since he kept reiterating that he wanted to show me the area’s "very good" hospitality, I was more than pleased with this turn of events. I just hoped that I would remember how to make these, actually very simple, dishes and then also really do it. My problem is follow through. I have lots of great ideas, but the fewest come into fruition and there are no good excuses for why that it is. Well actually, I blame it on netflix. I watched as the Italian cut off a large, and I’m talking huge, chunk of butter - was it possibly half of a stick, and put it into the already warm pan. 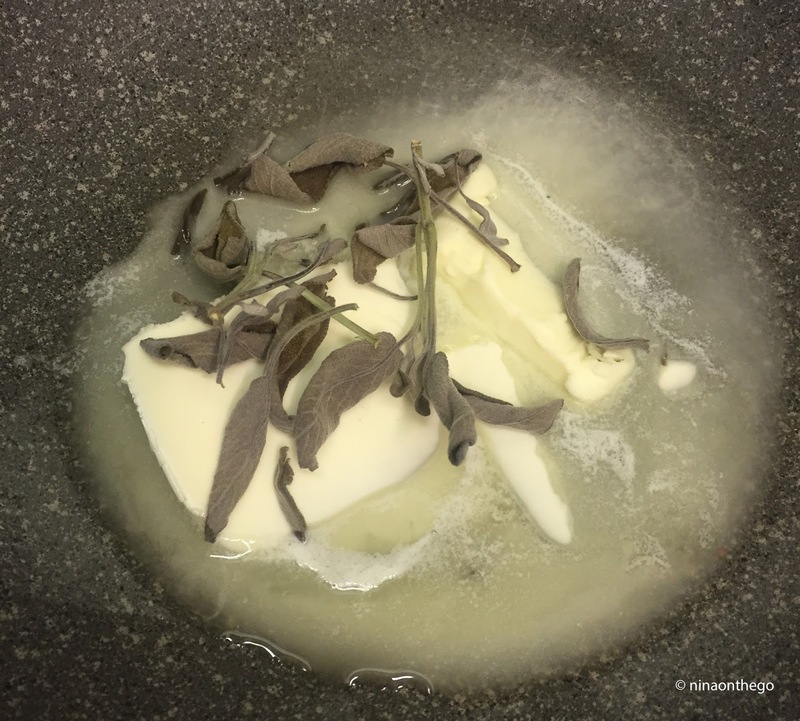 Then he picked up a bundle of long, luscious-smelling sage leaves and began pulling off the leaves and added them to the butter. Done. Simple as that. 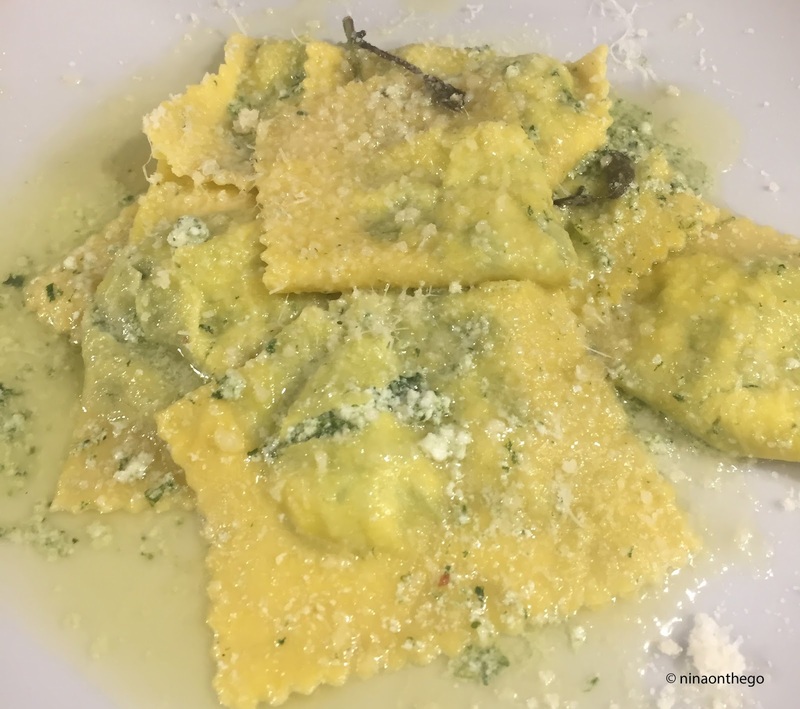 Add to that Tortelli, a regional stuffed pasta, ravioli-like, from Lombardy, filled with ricotta and spinach, and we had the most savoury and simple meal which would have cost loads in an Italian restaurant in Germany. He spooned seven large Tortelli pockets on my plate, coating them with the sage butter mixture and I’m telling you, it was more than plentiful. We should all try and eat as simply, as locally, and as serenely everyday. I think we would be happier, lighter on our feet and the world would benefit. “You like?” he looked uncertainly. “Yes, I love!” I assured him. “It really is perfect,” I complimented. He beamed and said, “Ya? Good. Good.” So sweet really. Receiving two home-cooked meals while on my seven-day Italian vacay was so not on my radar. But, it sure made me happy. And as the Italian drove me to the train station the next morning (“You don’t need to take a taxi! Princess, I have a car of course.”) I knew that these two days spent outside of Parma, being be-cooked (a lovely German term, meaning that someone who cares about you cooks a ton of food for you, while you sit and do nothing) with plump tomatoes, juicy hams, regional pastas and wines, was going to stay with me for a long while. I’m not sure if it was just the cooking, or maybe the monastic-infused hallowed rooms, or maybe just the inspirational Italian-ness of it all. You know, the cooking and loving and gesticulating with such passion and abandon! The Italian took my head in his hands and pulled me down for a kiss - really, so fast I didn’t have time to react, and as he held me there, I gently pushed him away and smiled and said “Okay, okay, stop the kissing.” “It’s just a kiss!” “Yes, but what about your girlfriend?” “I have no problem!” “Wouldn’t she have a problem?” He grinned and held his hand to his heart, “But I have no problem!” Oh my. I laughed, said goodbye and turned towards the station’s entrance.